This page sorts articles and help topics about Booknizer into categories, so that you can easily find any required information. Creating and using backup copies. Protecting your database with a password. Add audio books from files. Download information about books from the internet. Download biographies, bibliographies and other details of authors. Information about books in different languages. Use different online book databases. Sorting rules on the "Collection" tab. Sorting the main list of books. Create your own report templates with the Report Builder. Playing audio books with the built-in player. Using an external audio player with Booknizer. Enter information about books manually. 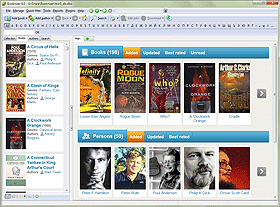 Import information from other book catalog programs. Import your library from Book Collector. Update paths to e-book files. Update paths to audio book files. Select Hugo winners and nominees. iPad, Android and Tablets as eBook Readers. What do people use to read. Types of e-book reader displays. Books over the air: storage and connectivity.